Christie Leigh Harner, professor of English and creative writing, specializes in Victorian and 19th century literature. Every student’s college experience is influenced by their parents, whether they helped choose what college to attend, what major to pursue or what activities to participate in. On Tuesday, the College sought approval from the Hanover planning board to move forward with the Thayer School of Engineering’s $200 million donor-funded expansion. Though she was one of only a few Pueblo students at Stanford University, Sarah Palacios found a welcoming and supportive Native community. 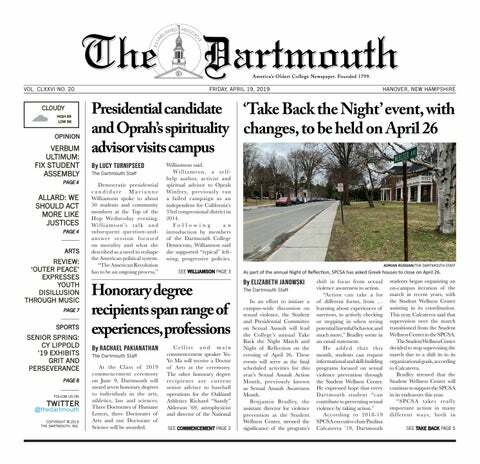 Dartmouth is home to a thriving ecosystem with a variety of flora and fauna that fill its environment, ranging from friendly canines to historic pines. The English and creative writing department at the College will welcome critically-acclaimed poet Joshua Bennett this upcoming fall as a new assistant professor. Buff: The Ideal Male Body? On any given morning, as I walk to my 9:00 a.m. class, I have a 50 percent chance of running into — that is, physically colliding with — someone running on the sidewalk.